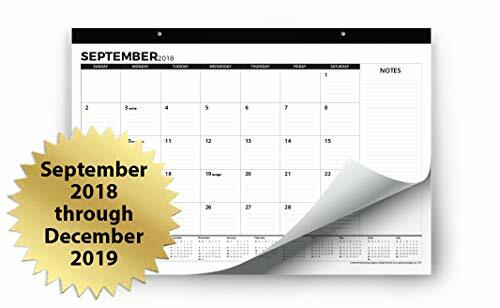 Desk Calendar 2018-2019 (Use Monthly from September 2018 to December 2019) - Large Desk Pad or Wall Calendar - Big Monthly Pages 17'' x 11'' - by Royal Mountain Print Co. Brand: Royal Mountain Print Co.
View More In Desk Pads & Blotters. Desk Pad or Wall Calendar for 2018-2019: This monthly desk pad calendar is perfectly sized to hang on your wall or sit on your desktop. With an 11x17-inch overall dimension, its perfect size won't get in the way of your desktop work, but is still large enough to accommodate a long list of to-do's, appointments and notes. It's great for teachers and schools, executives and businesses, home and office, and serves as a perfect planner. Desk Pad Size: the calendar is perfect for desktop use without seeming bulky; it's sized at 11x17 inches. Hangs on Wall: with two hole punches, the large monthly calendar is also great for hanging on your office wall. Use Immediately From 2018-2019: it runs from September 2018 to December 2019, so you can get maximum use from this desk pad calendar. Does Not Bleed Through: premium grade white paper prevents ink bleed. Big Open Spaces: lined boxes allow for plenty of room for notes and activities to be recorded neatly. Major Holidays Included: the calendar notes all major U.S. holidays, including Christian and Jewish holidays. Easy Tear-Away Pages: perforated monthly pages allow for easy, clean removal of each month's page. Durable Cardboard Backing: a cardboard backing provides a sturdy support for writing or hanging. Corners Won't Curl Up: clear plastic corner protectors are adhered to the cardboard backing, preventing page curl. Clean and Professional: the classic black and white pages feature a minimalistic design, and modern fonts make this desk pad calendar perfect for home or office. Love It or Your Money Back: If for any reason you are unhappy, let us know and we'll refund your money. Satisfaction Guaranteed: Your satisfaction is our No. 1 goal, so if you are displeased with our products or service for any reason, we will happily refund your money. No hassles! DESK PAD SIZE: the calendar is perfect for desktop use without seeming bulky; it's sized at 11x17 inches. ALSO HANGS ON WALL: with two hole punches, the large monthly calendar is also great for hanging on your office wall. USE IT IMMEDIATELY FROM 2018-2019: it runs from September 2018 to December 2019, so you can get maximum use from this desk pad calendar. Manufacturer: Royal Mountain Supply Co. Publisher: Royal Mountain Supply Co. Studio: Royal Mountain Supply Co. If you have any questions about this product by Royal Mountain Print Co., contact us by completing and submitting the form below. If you are looking for a specif part number, please include it with your message. By GRUPO ERIK EDITORES, S.L.